The Bride // Ronnie and I dated for 13 years before tying the knot! We finally felt the time was right and so Ronnie proposed to me on Mackinac Island, with three stacking bands, which I knew I wanted instead of a traditional solitaire. Ronnie likes to think that he surprised me but his nerves were evident as we peddled around the island. Exactly 2 years to the day later, we were married at the Toledo Country Club. The Bride // Our wedding coordinator, Bee for the Day was invaluable. They really made the day what it was. I would not take back working with them for anything. We wanted to keep the wedding intimate; I wanted it to feel like a dinner party as opposed to a banquet-hall style event. We did not have a wedding party and just under 100 guests were in attendance. Ronnie's cousin served as our officiant and my family's dog (along with my father!) walked me down the aisle. The entire day felt very personal and fun. We used Bartz Viviano for the decor and their designer, Amanda really blew us away! She understood my vision of metallics, dark green, and white and incorporated ivy, exotic flowers, and gold accents to complete the look. 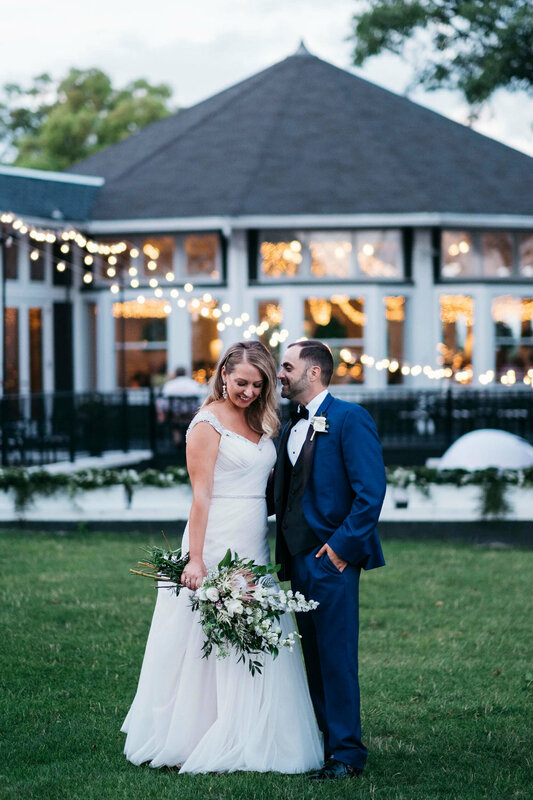 I like to say that my theme was "Great Expectations meets Great Gatsby": a few glamorous elements were offset by the wild, overgrown greenery and lights from the ceiling and candles everywhere created a romantic, soft glow.